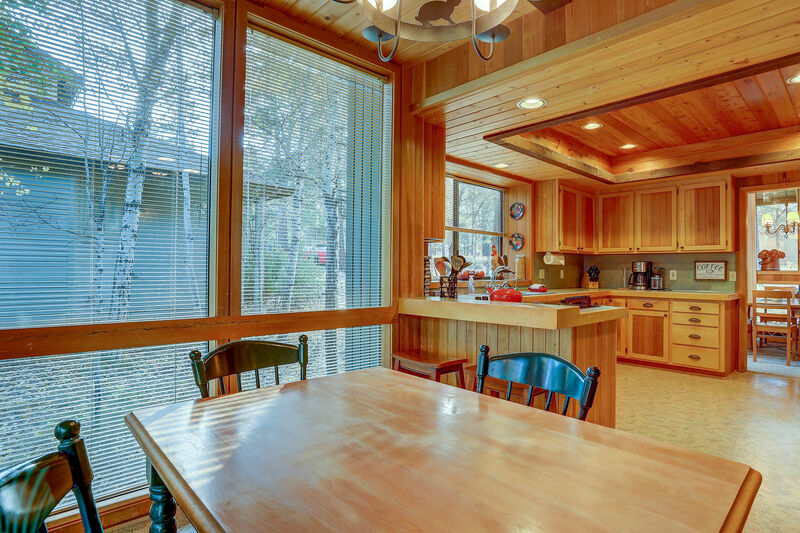 Piney Woods Cabin at 22 Rogue Lane is an ideal cabin retreat for your family and friends! 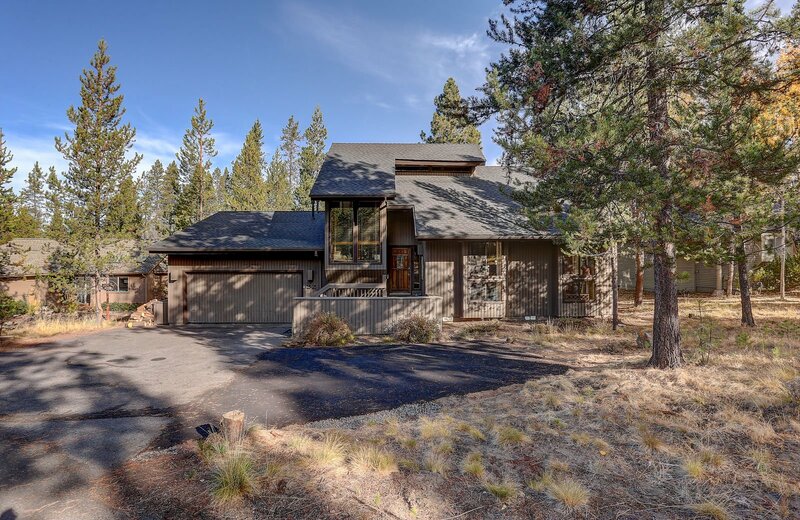 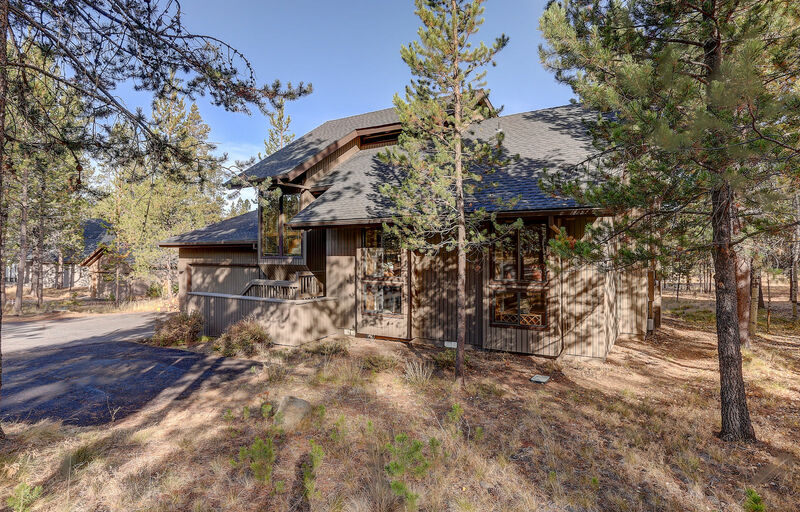 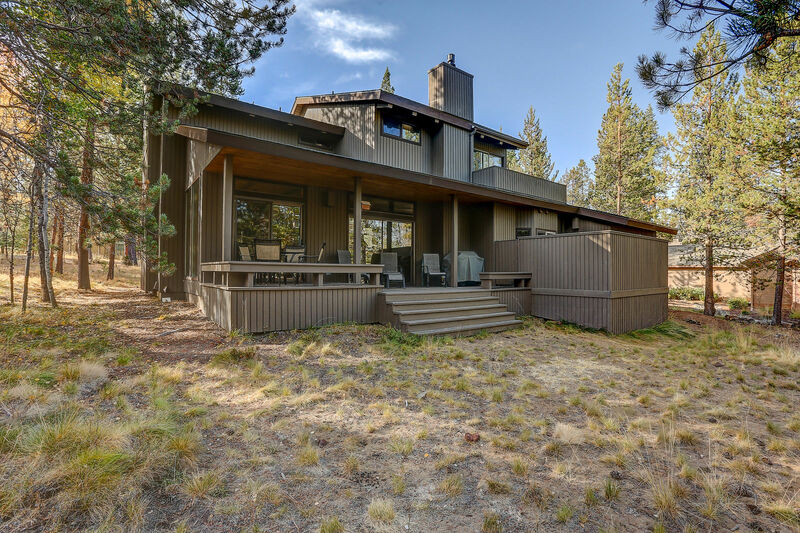 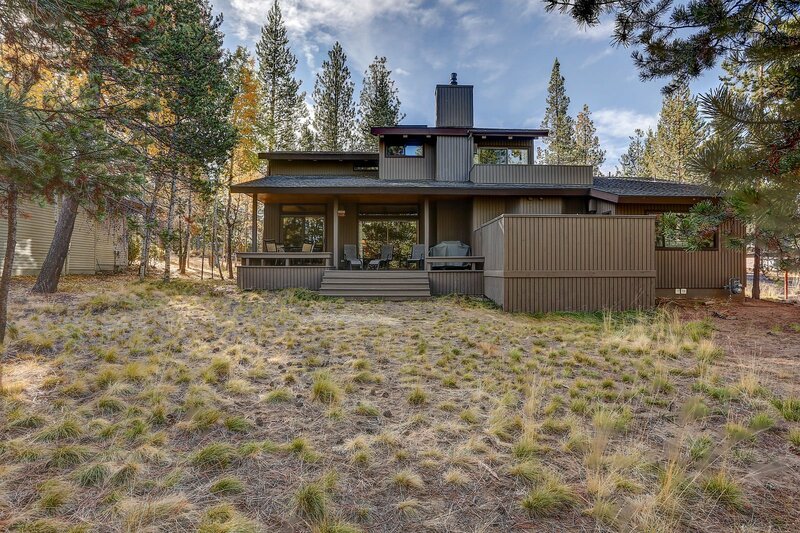 This vacation home is centrally located in a quiet area of Sunriver, just a short walk from the Deschutes River and Cardinal Landing Foot Bridge. 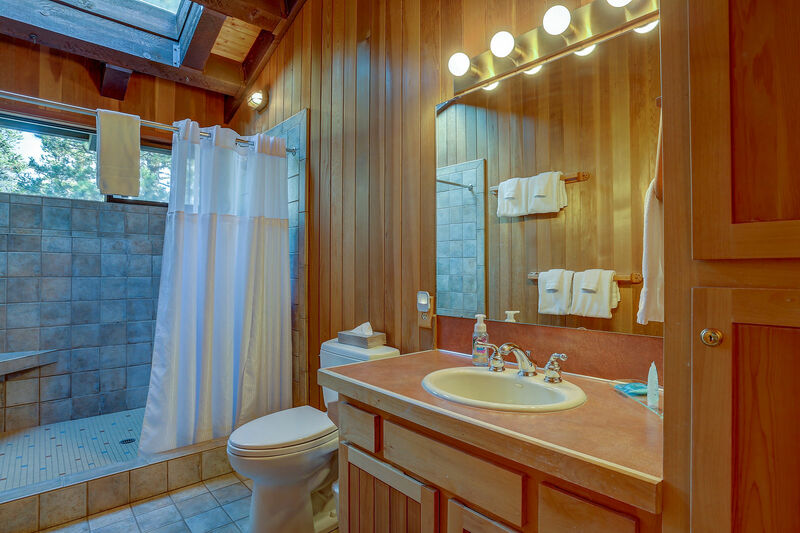 It is also less than a 10-minute bike ride to the SHARC and Fort Rock Park, and has unlimited use SHARC passes for 10. 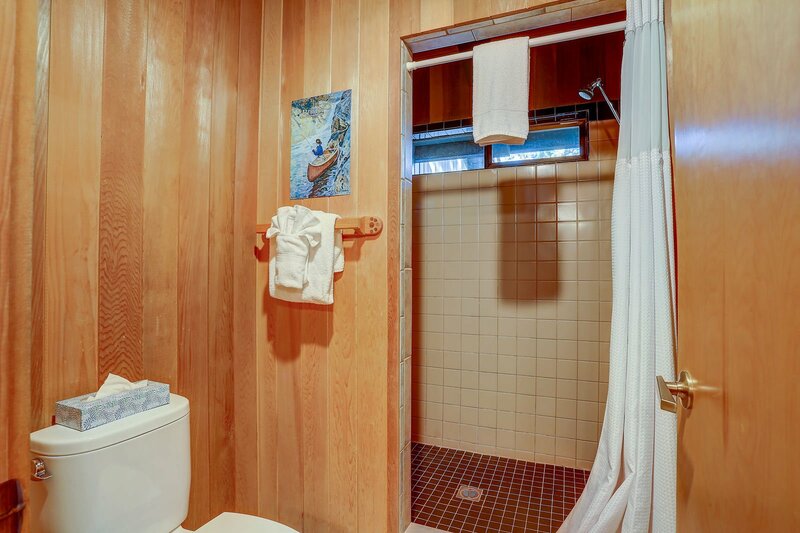 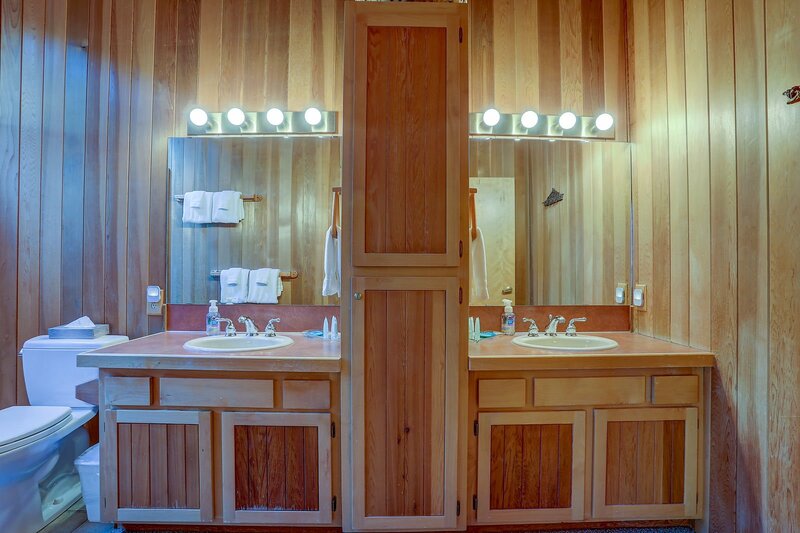 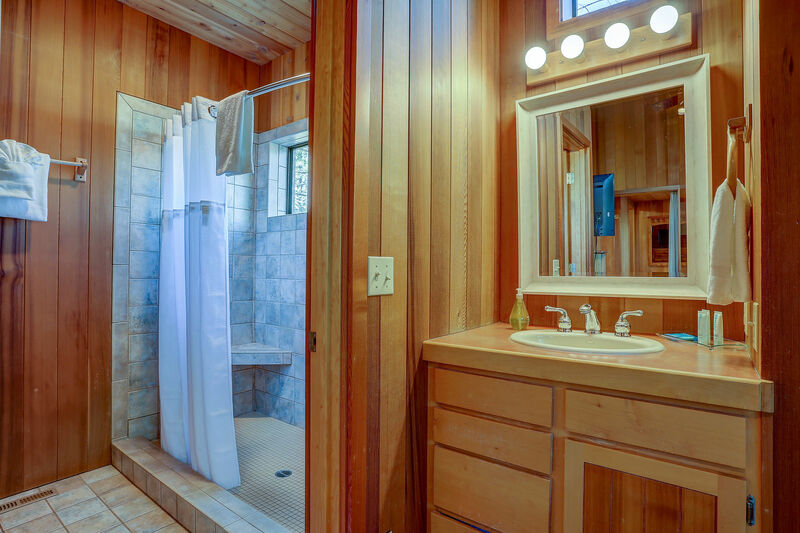 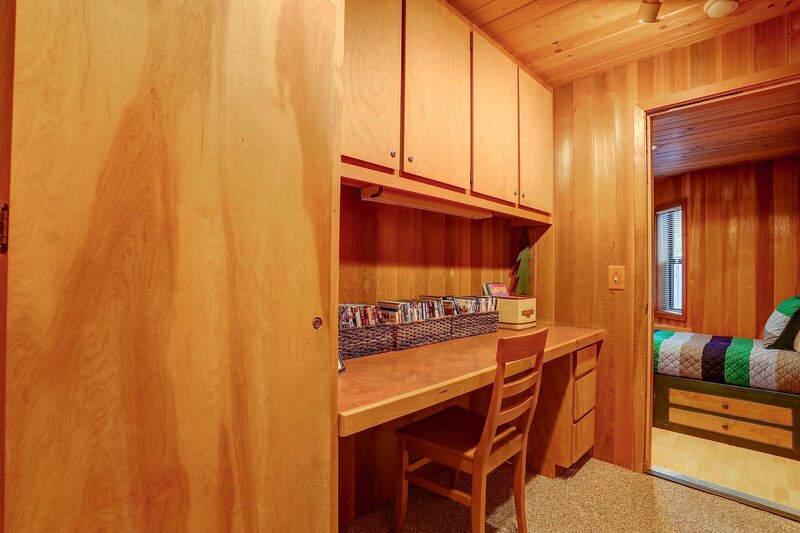 Many comforts and amenities await you at Piney Woods Cabin! 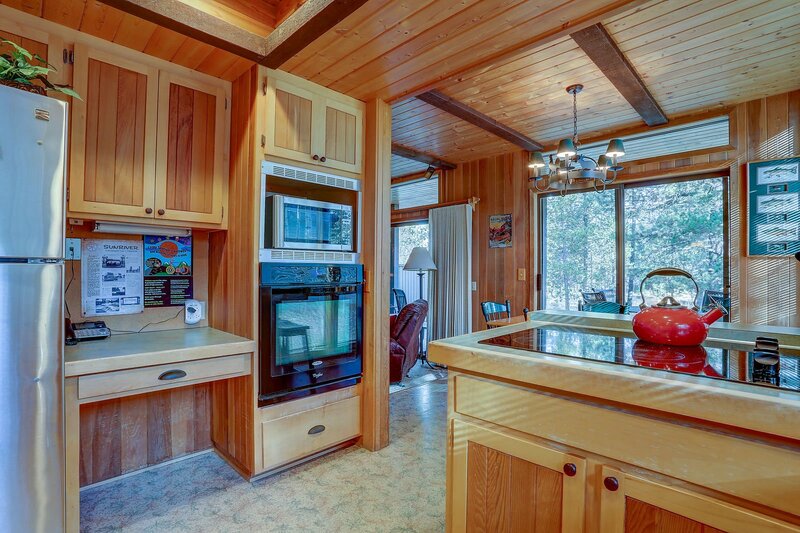 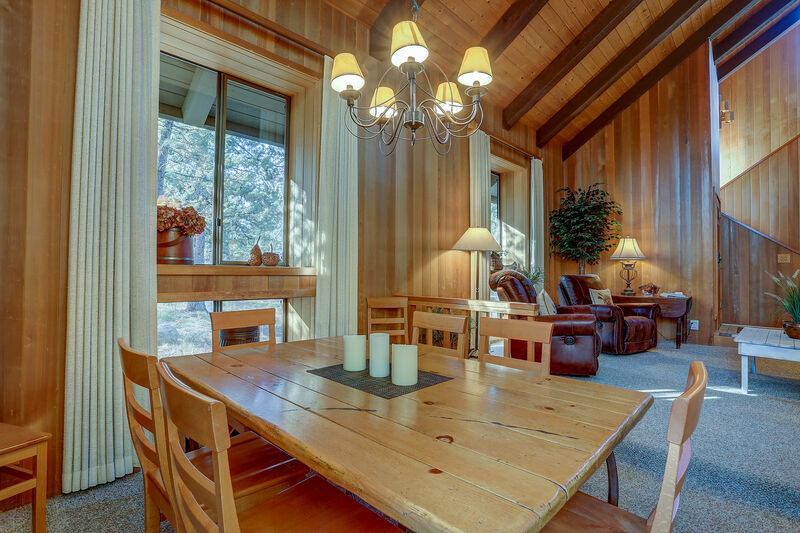 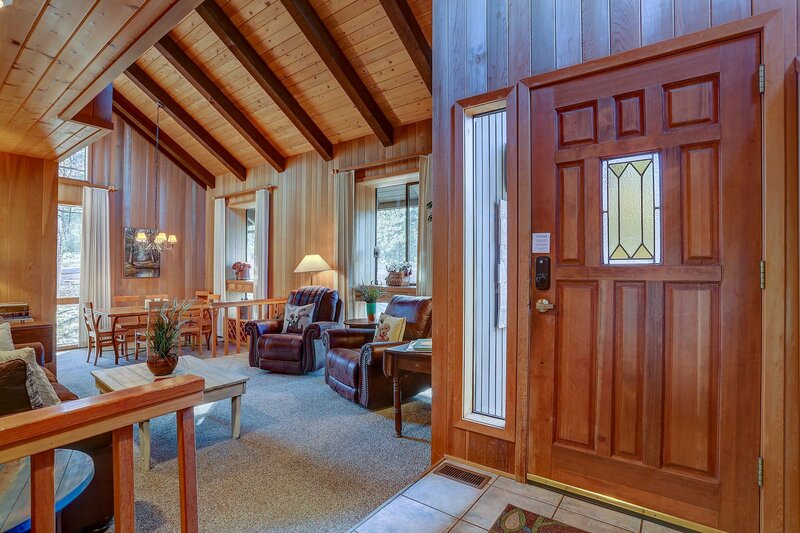 This spacious 3 king master suite, 2-level, 2,514 square foot vacation cabin has 4 bedrooms and 3.5 bathrooms. 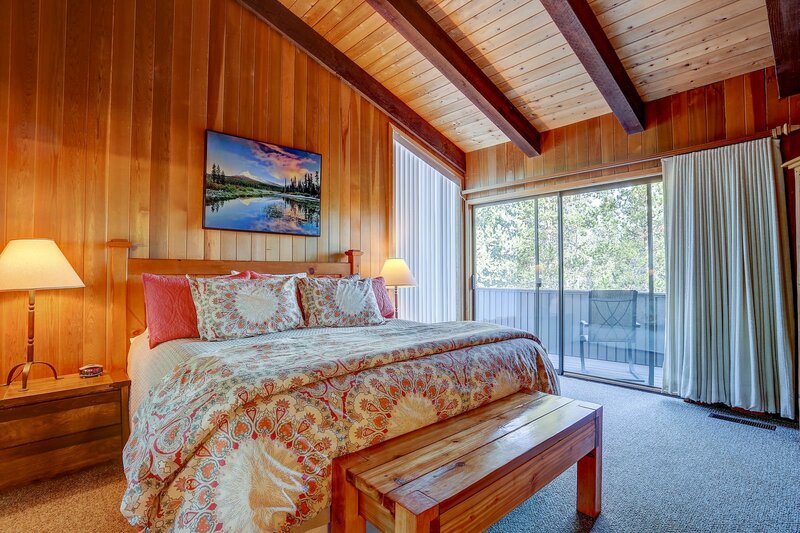 The master suites have ultra-comfortable beds (2 pillow top and one plush) and luxurious bedding, helping you to relax and rejuvenate at the end of your day. 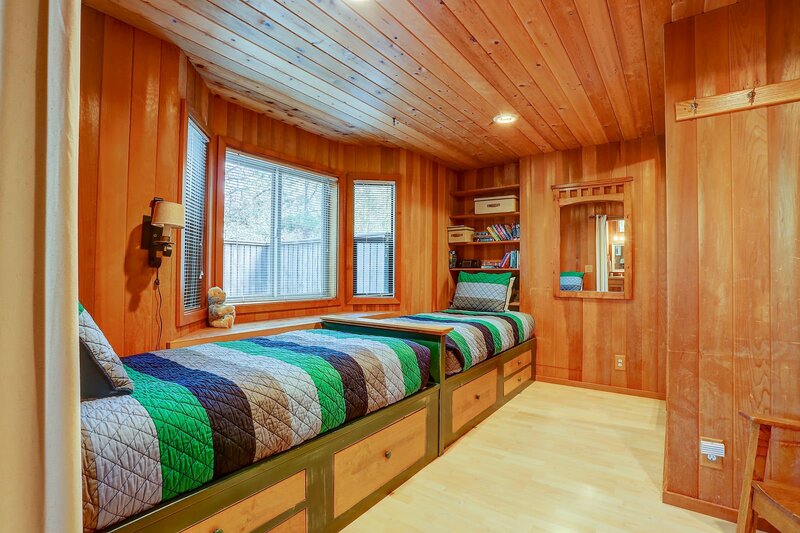 The downstairs king master has an adjoining room with a set of twin beds, making this an ideal family suite at the back of the house. 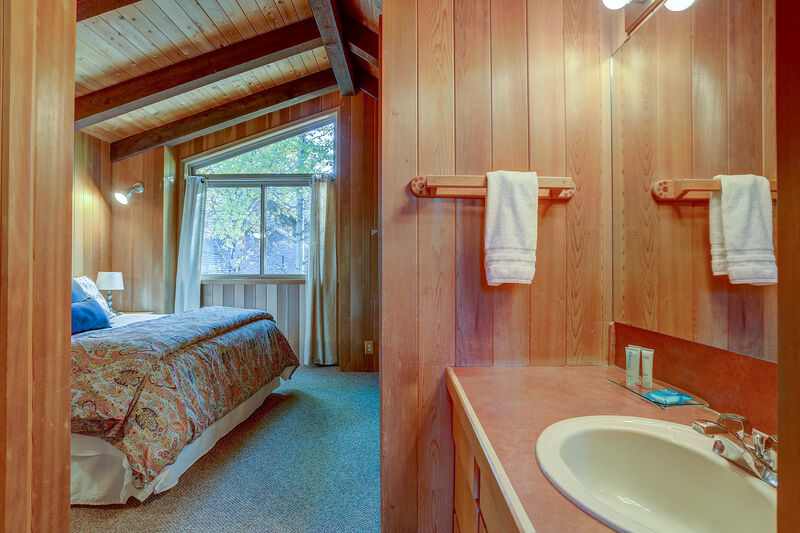 The 2nd and 3rd master suites are upstairs, each with a private bath, and one with a balcony overlooking the quiet forest. 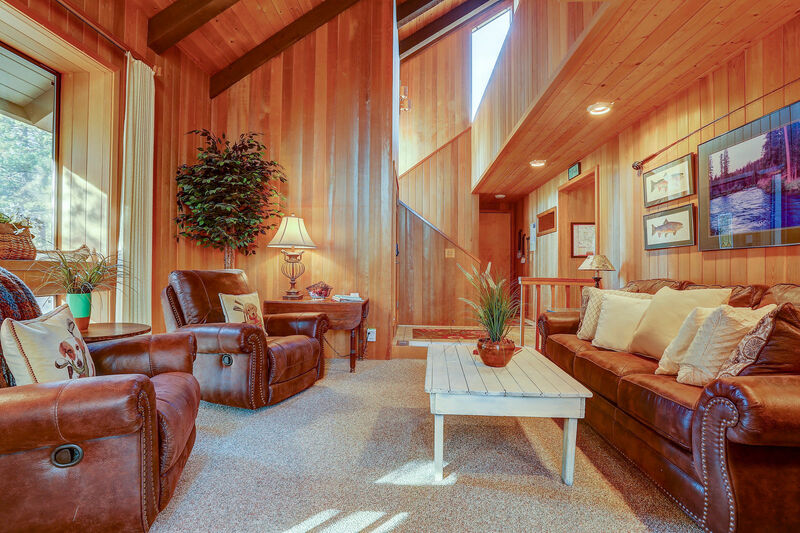 There is also a comfortable queen memory foam sofa sleeper in the living room, 2 twin sleeping pads upstairs, and comfortable couches and chairs (that also recline for a perfect nap) in both the living and family rooms, providing ample seating. 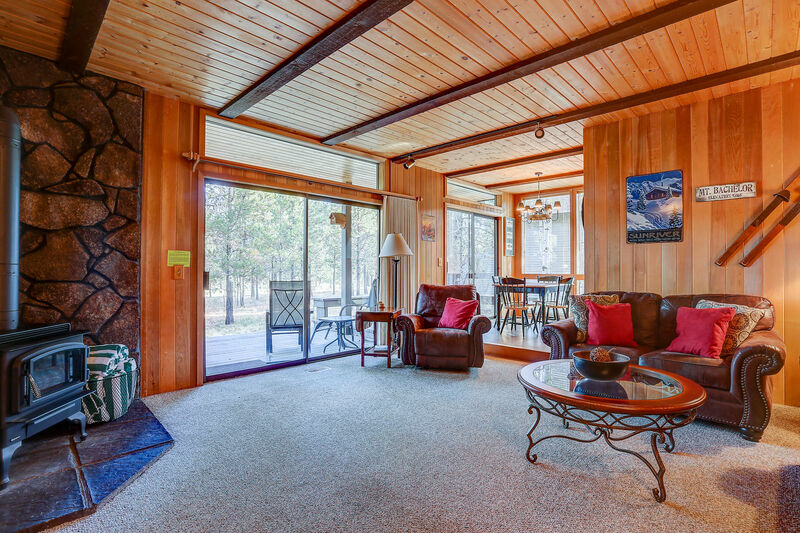 Entertainment for the entire family at Piney Woods Cabin includes 4 TVs. 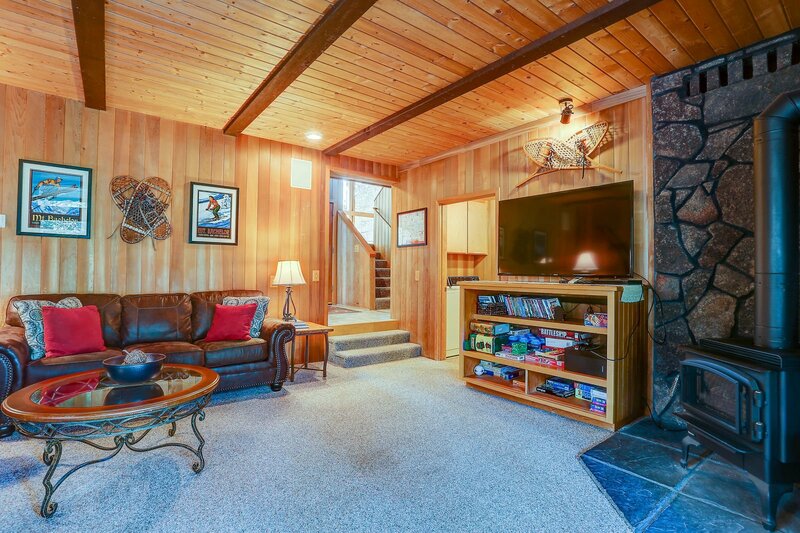 A 60-inch flat screen Smart TV with Blue Ray/DVD player is in the family room with a large movie library and stereo/CD player. 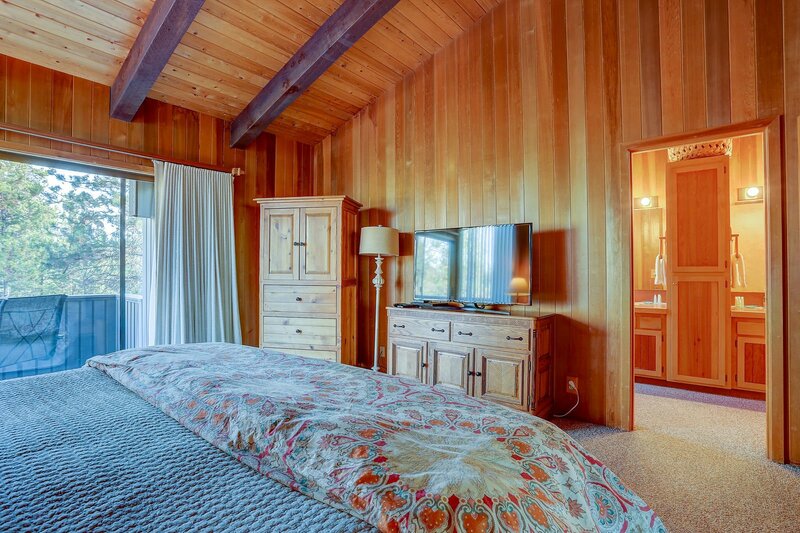 Flat screen TVs and Blue Ray/DVDs with streaming capability are in all 3 master suites. 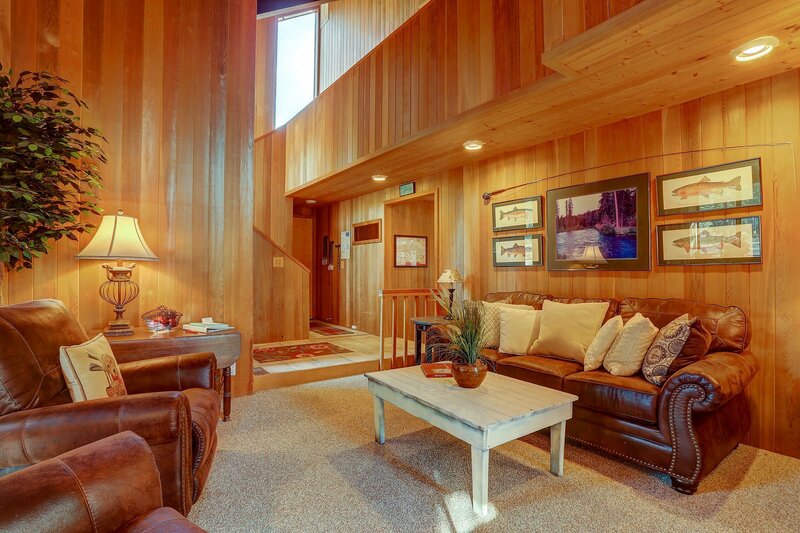 Expanded cable and Wi-Fi are throughout the house. 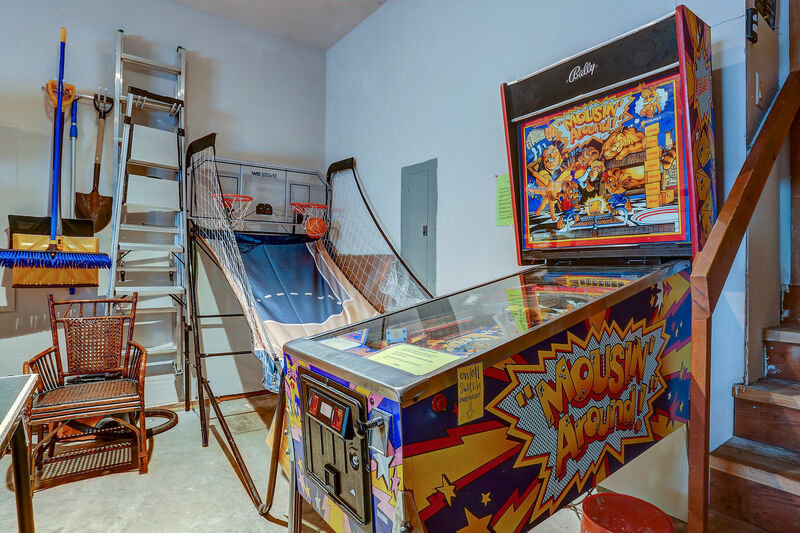 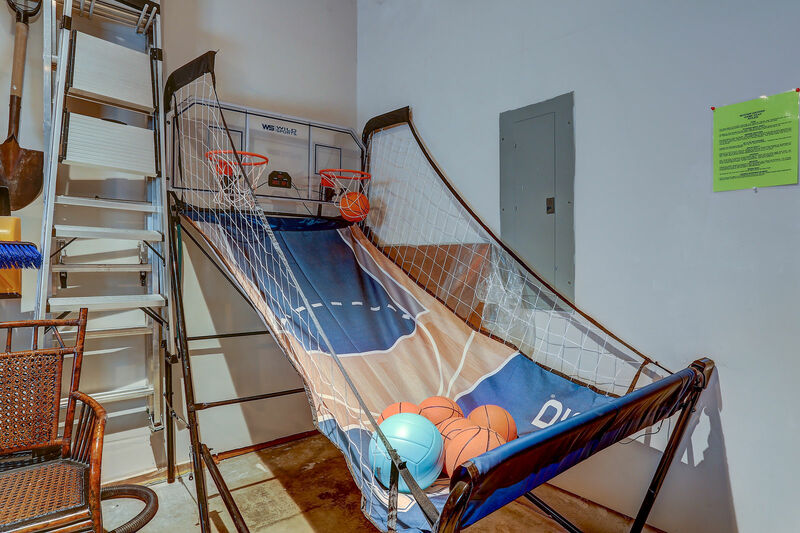 The home has ping pong, pinball, and many choices of board games. 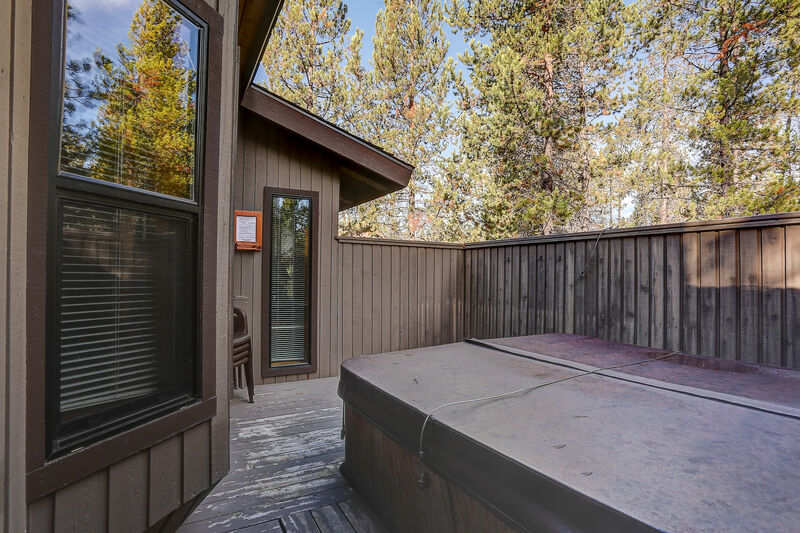 A private hot tub and covered deck with BBQ and patio furniture allow you to relax and enjoy the outdoors. 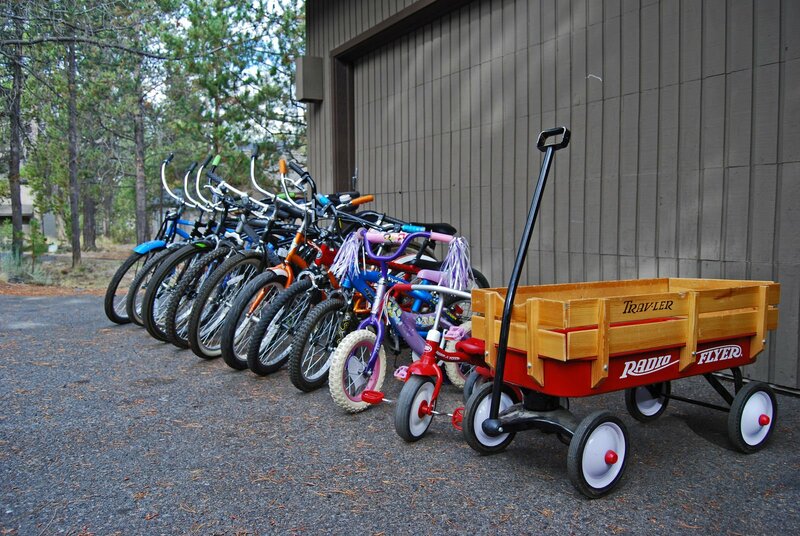 There are 10 bikes (6 adult + 4 youth), a 2-child bike trailer, and a Radio Flyer wagon with wooden sides to help you explore the more than 40 miles of paved bike trails throughout Sunriver. 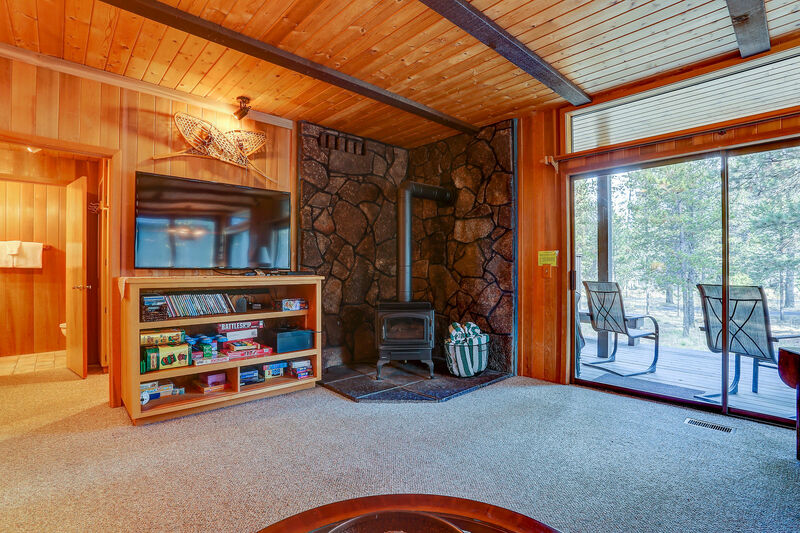 A new gas-fueled remote-controlled family room stove recently replaced the wood stove so no more wood hauling! 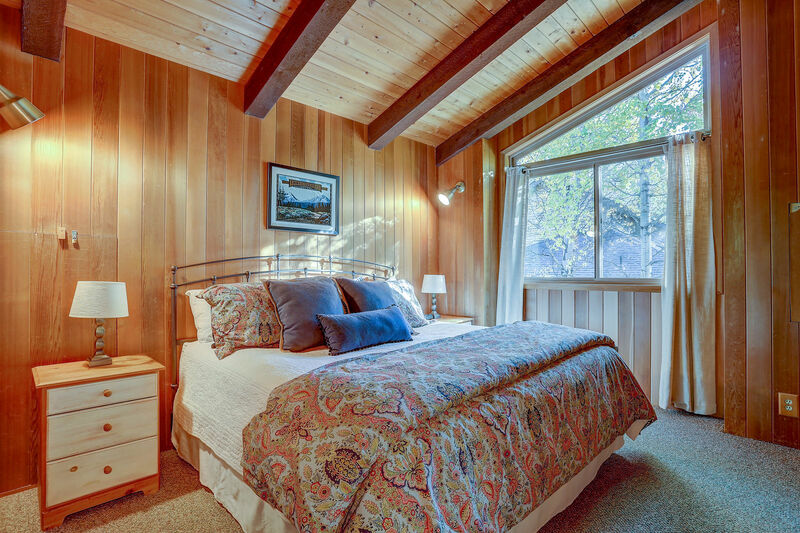 New bedding, furnishings, kitchen accessories, and decor give the home a fresh update, while the home's warm wood accents provide a true Sunriver feel. 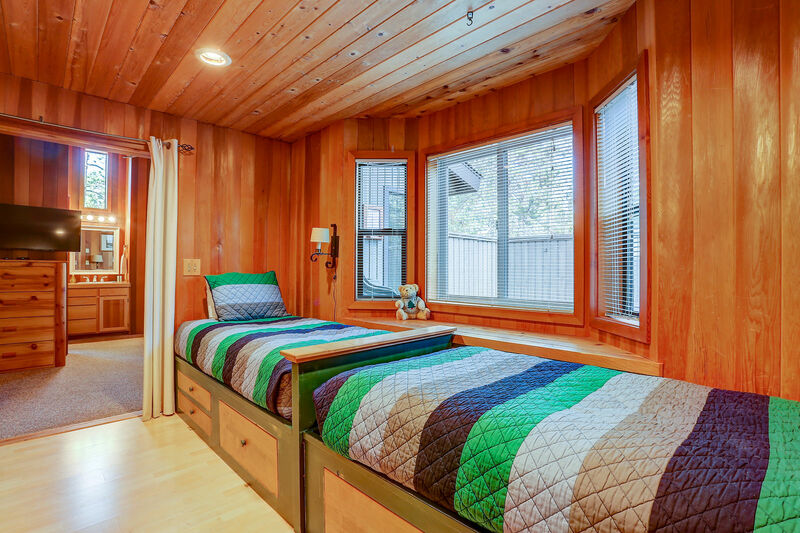 For the convenience of packing, a portable crib, stroller and 2 booster seats (that attach to chairs) are included. 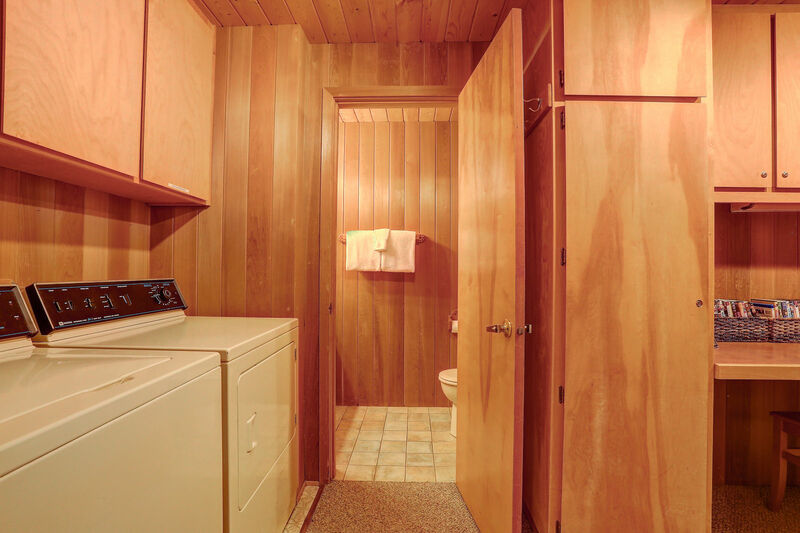 On the main floor off the family room, there is a half bath, full size washer/dryer, and desk area with an electronic device-charging outlet (6 plugs + 2 USB). 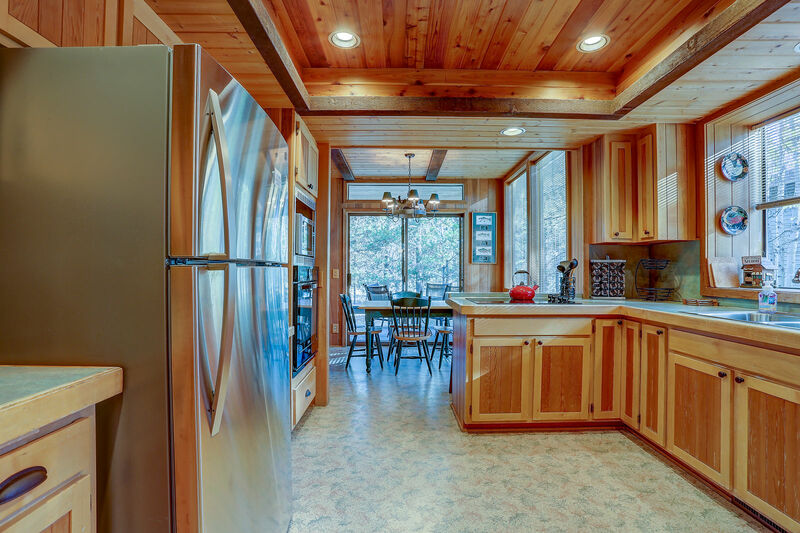 You will enjoy a well-equipped kitchen as you entertain and whip up special family recipes to share with your family and friends! 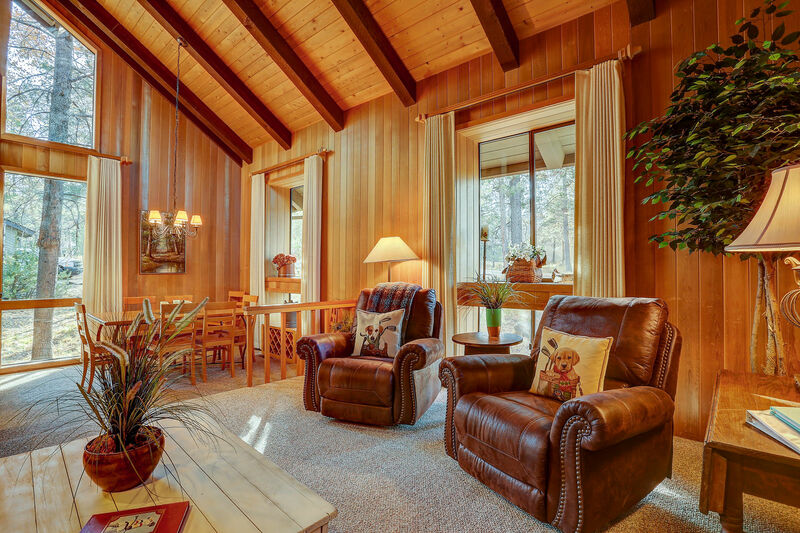 Coffee, popcorn, hot cocoa, hot cider and tea are also available for those cozy evenings together. 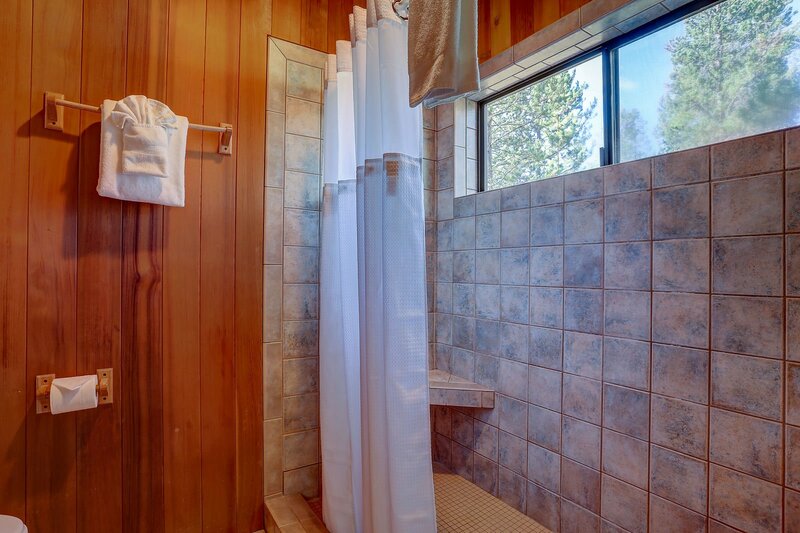 Spa soap, shampoo, and a few other small amenities are included to help you 'get by' if you forget your own supply. 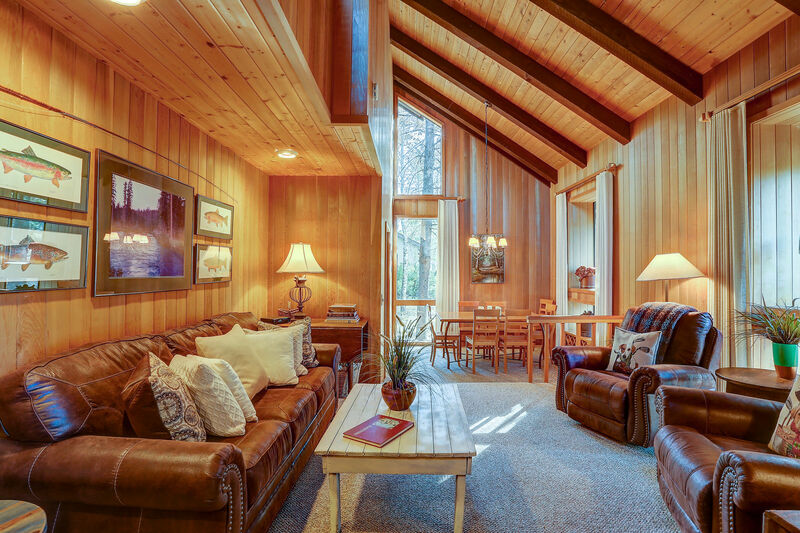 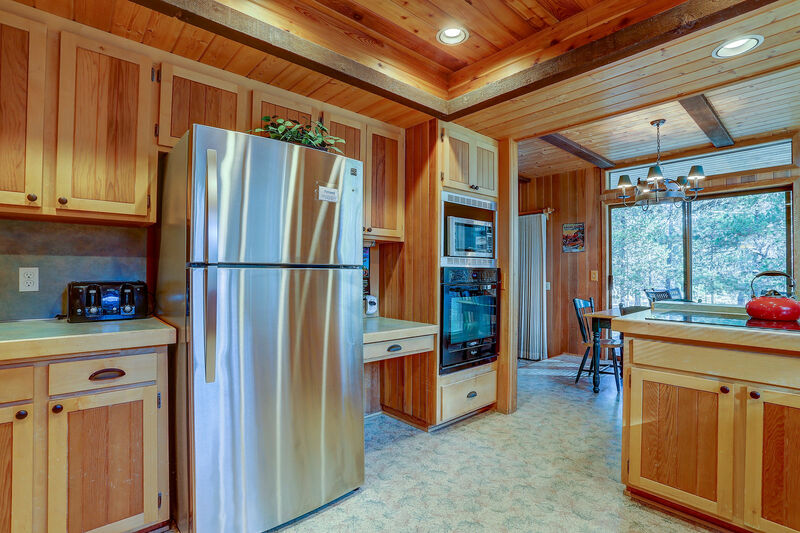 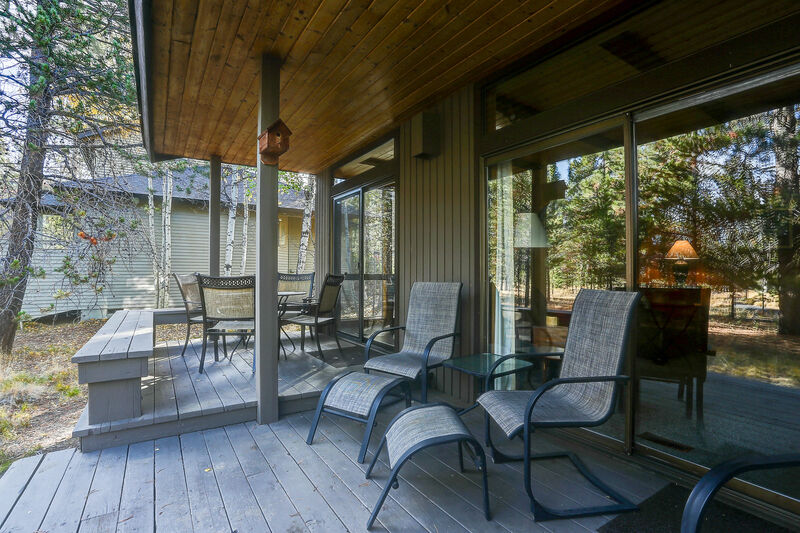 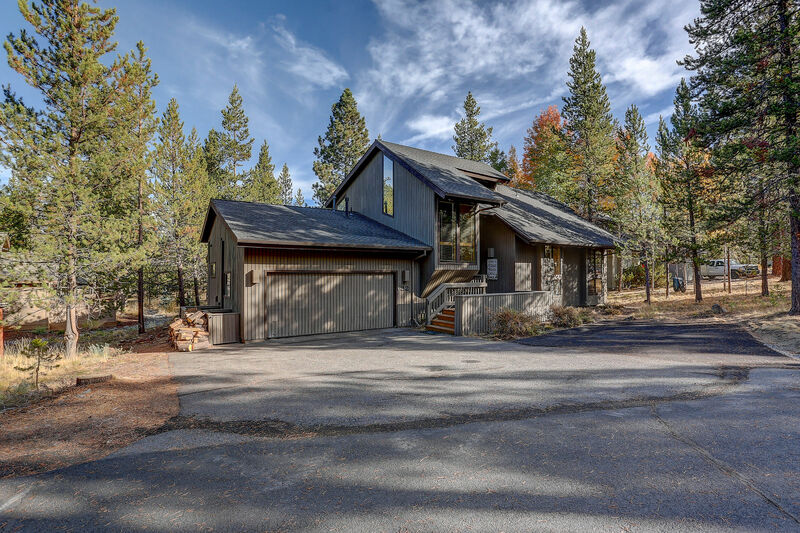 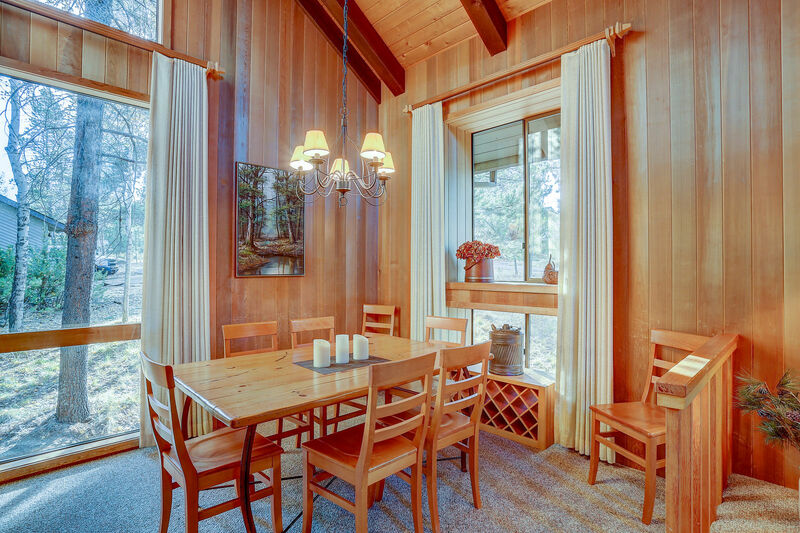 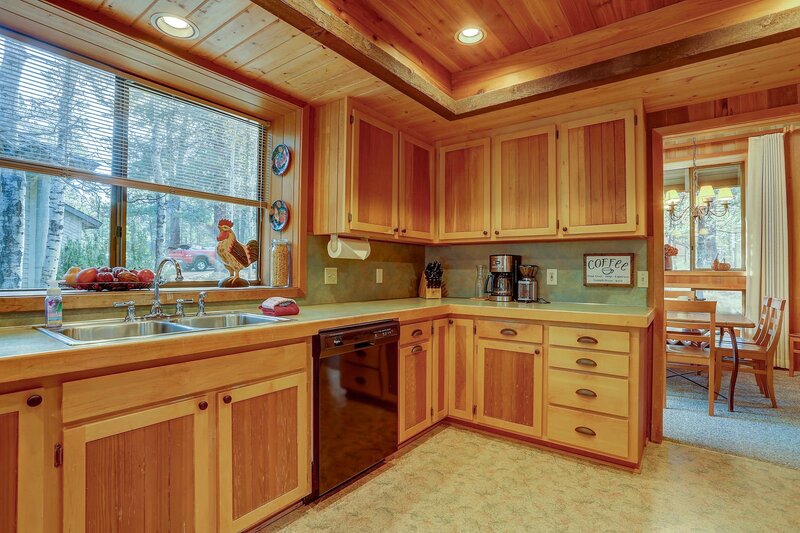 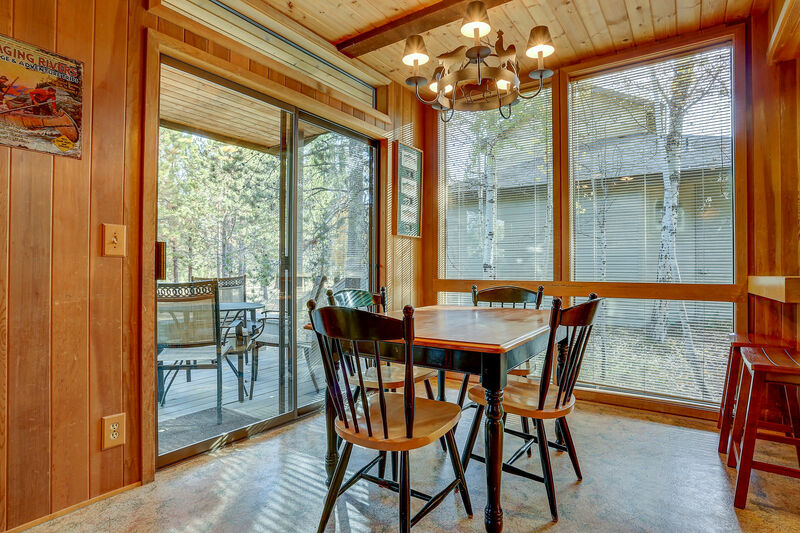 Come stay at Piney Woods Cabin for a memorable Sunriver vacation and experience the tall pines of Central Oregon in a cozy, yet spacious cabin with all the comforts of home!